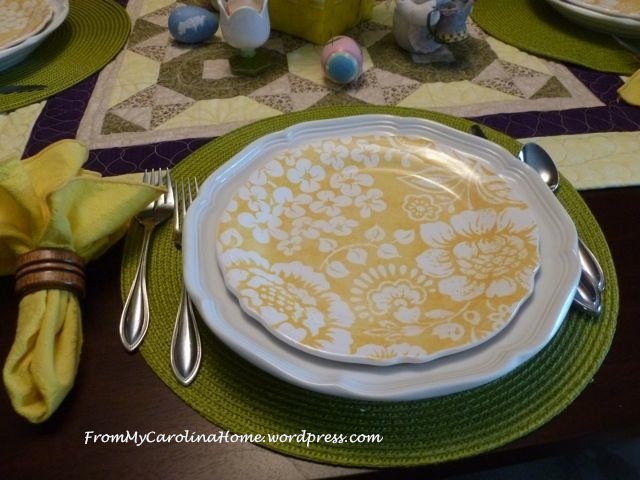 I just love this tablescape! I was gathering some pretty things for the table, and I really wanted some springtime colors. 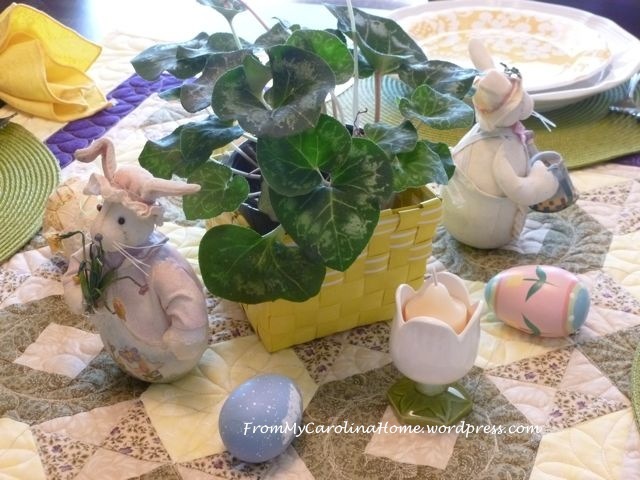 So much of my tablescaping in the past has been in the cooler months. Seems I like to do more nesting when it is cooler. 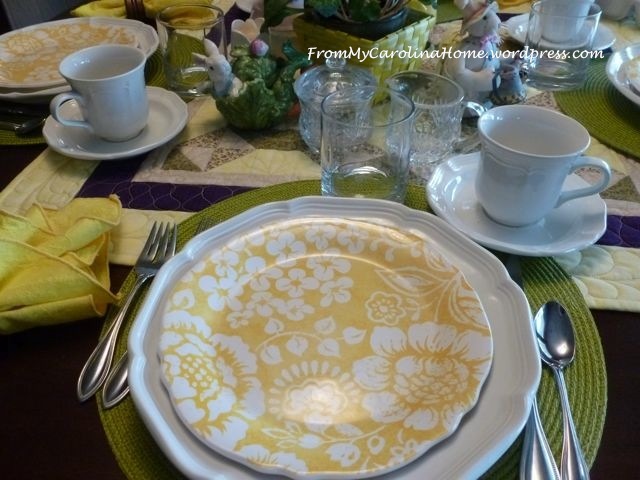 But, I saw these in a catalog, and I just had to get these wonderful yellow plates. 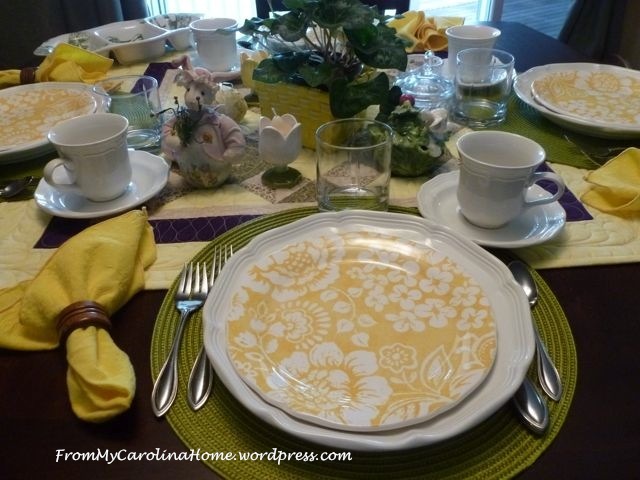 Lovely yellow with white printed floral pattern, goes really nicely with the grass green placemats. I set them on white dinner plates. 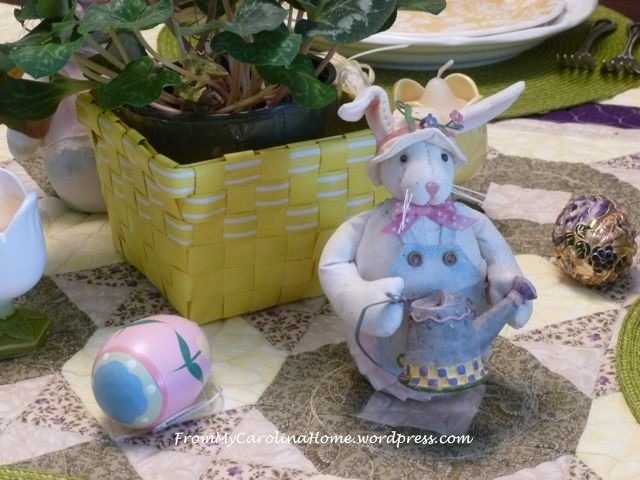 These cute little gardening rabbits made a perfect accessory for the centerpiece. 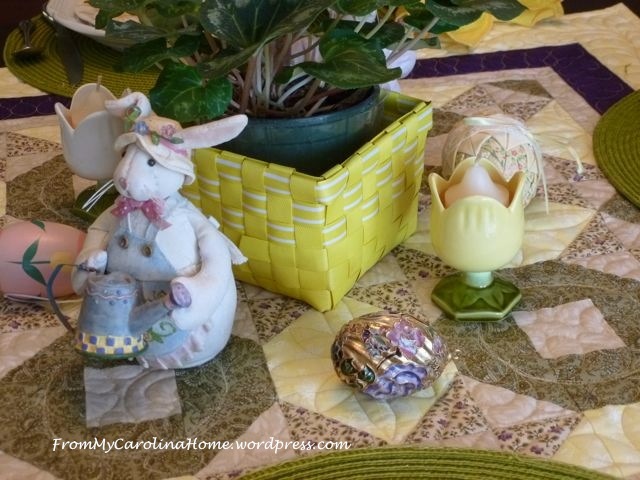 I took the cyclomen that I received from the quilt club, and put it in a little yellow basket for the center. The quilted table topper is a recent finish, but I can’t show it to you just yet. I have to finish the second one, then you’ll see both. FYI, no, it isn’t a Scrap Dance, LOL!! 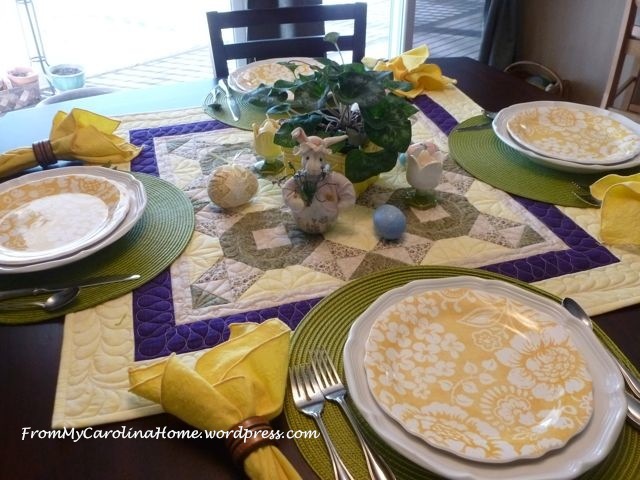 The yellow napkins pick up the yellow on the quilted topper. I scattered a few eggs around the table too. 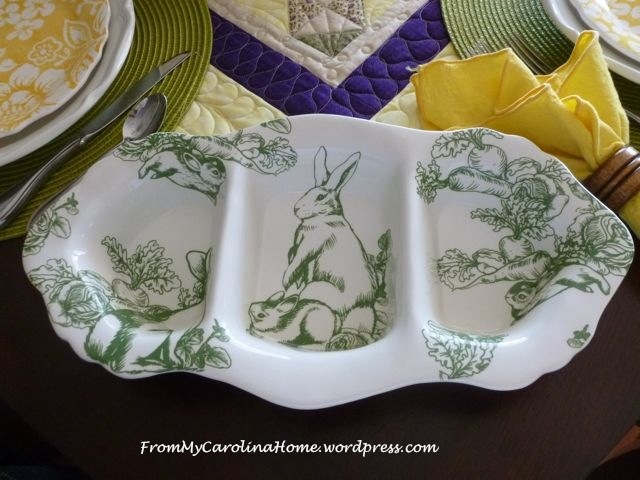 This charming rabbit serving dish is perfect for this table too. The little tulips are egg holders, but I put votive candles in them. The little rabbit in the lettuce is a jelly server, but I sometimes use him for sugar. All set and ready for a meal. Welcome Spring!! Are you ready? How charming! ALL OF IT! 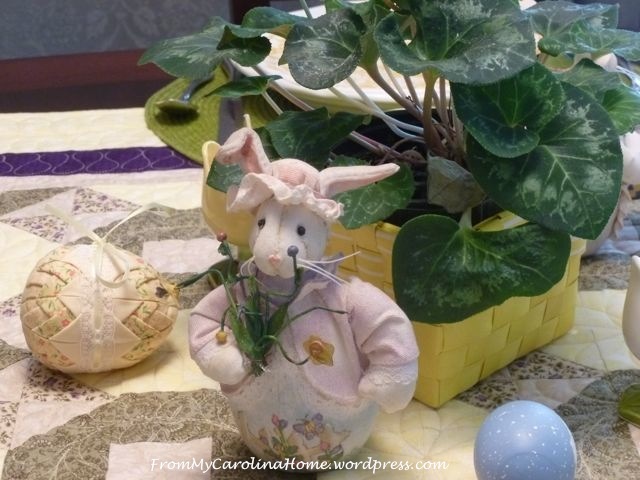 My fave centerpiece for Easter, when I used to entertain more, was a low bunny vase with fresh asparagus! After the meal I’d toss the asparagus in the fridge to have for dinner on MON. HA! Your table-scape is the most appealing I’ve seen!! This is just so pretty! It feels just like my grandmother’s house. She always had such beautiful settings and cups and linens and trinkets. I’m not sure what they were called, but she had sets of dishes that were a large ovalish shape with a pattern and a cup that set in a depression on the side. They weren’t exactly oval because there was a design to the edge … like a flower or something. Anyway we had fancy sandwiches and tea. Thank you Carole for bringing back those memories! Absolutely beautiful! 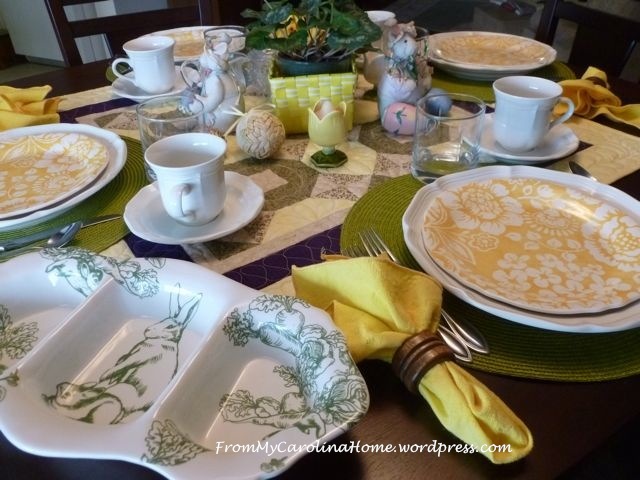 I love your new dishes…….makes me want to go out and buy a new “buttery” colored set! I did make a couple of table runners for our Easter brunch and it felt so good to use a beautiful Spring color palette for a change!